I finally managed to find some time to finish my overdue Davao City Travel Diary. It’s been more than a month now after the trip but the surreality of that experienced is still clearly etched in my mind. On our third and last day in Davao, I’ve discovered the places and things that made me finally fall in love with the place. After that day, I was finally able to say… I won’t mind going back to Davao City for a third time. 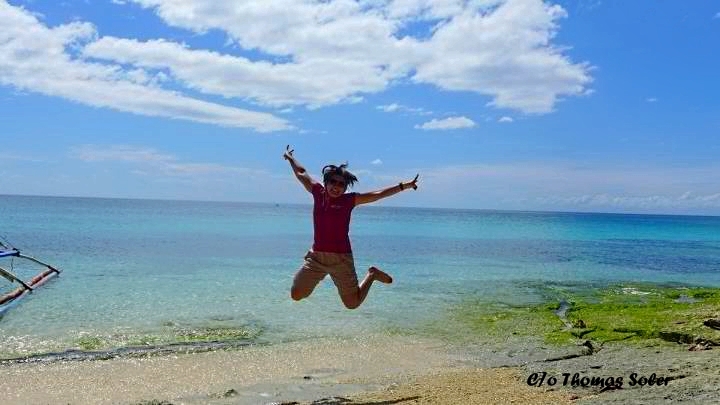 We were schedule to start our island hopping tour at 7:00 AM so we woke up very early. While waiting for the boat, Bounty Hounter, and the boatman we decided to stroll first around Kaputian area and bought bread for breakfast and some snacks to eat during the tour proper. When we got back to the inn, we surprised to hear someone greeting us, “Pangit, pangit! (Ugly, ugly!)”. 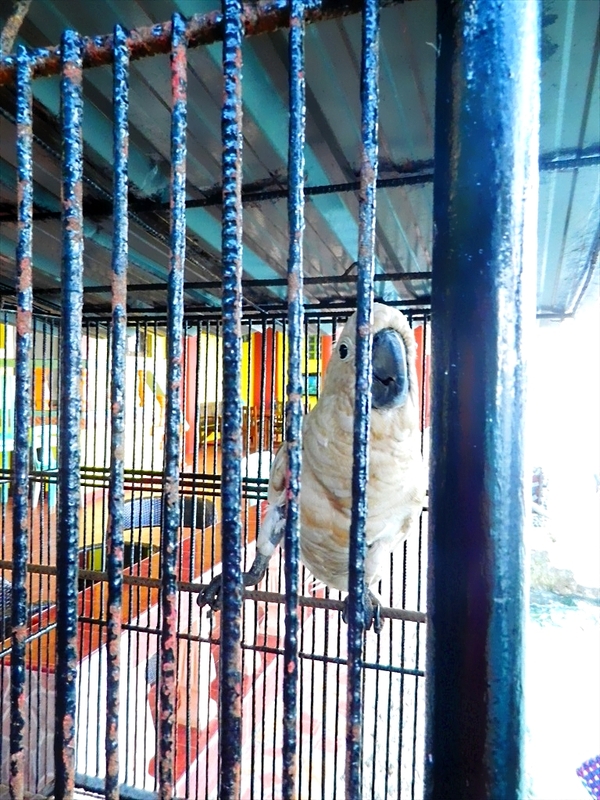 Turns out that someone was actually a parrot that can say all sorts of stuff from pangit and magandang umaga (Good morning) but not gwapo (handaome) and maganda (beautiful). After playing with Pangit, we finally left for Talicud Island at around 8 AM. The sun was still not so high when we left and we still had an amazing “pseudo” sunrise view of Samal Island. The tour was not really island hopping since there was only one island that we can tour. However, Talicud Island has a very long coastline so there were a lot of interesting structures and rock formations to see. In the middle of nowhere the boatman stopped at in area the locals call Coral Garden. 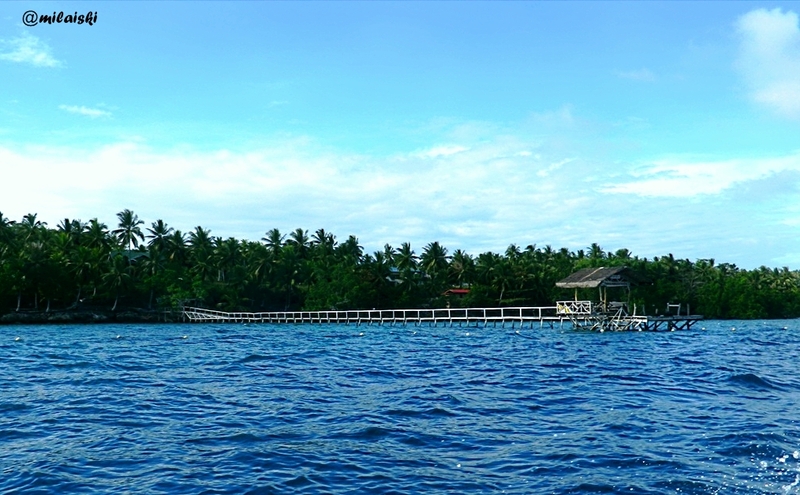 Based from he name itself, this is an area of the sea where the corals are quite eye-catching. I wasn’t able to verify that since I can’t swim. Only Thomas, Conney and Cez jumped into the water. Though there were life vests in the boat and my fear for water was reduced thanks to the exhilarating whitewater rafting activity, I still have no guts to jump in an open sea. A few more travels I may finally be able to conquer the place that almost killed me several years ago. 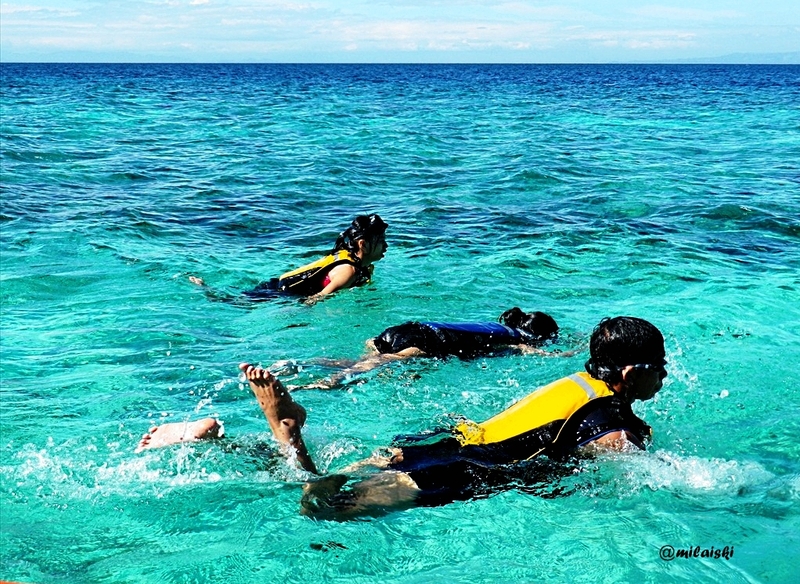 I may have not jumped but on the brighter side, I was able to pictures of my three friends wading in the stunning waters of Samal. My friends amongst the perfect sea. 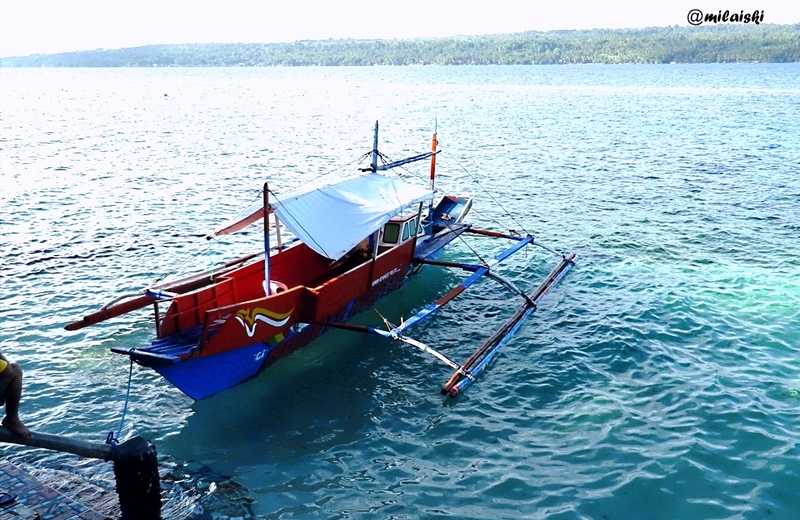 During our stop in the Coral Garden, another boat stopped by near us and one of its passengers transferred to our boat. He claimed he was a Badjao, one of the ethic tribes in Mindanao, and he kept convincing us to buy pearls. Unfortunately, we didn’t bring any money with us on the trip so we told him we were sorry we will not be able to buy pearls. He still stayed during the entire time our boat was stopped. When we are about to leave, he also returned to his boat and mentioned to his companions, “Wala. Lahat kuripot. (No luck. They are all close fitted).” Ouch. Second time in my travels. 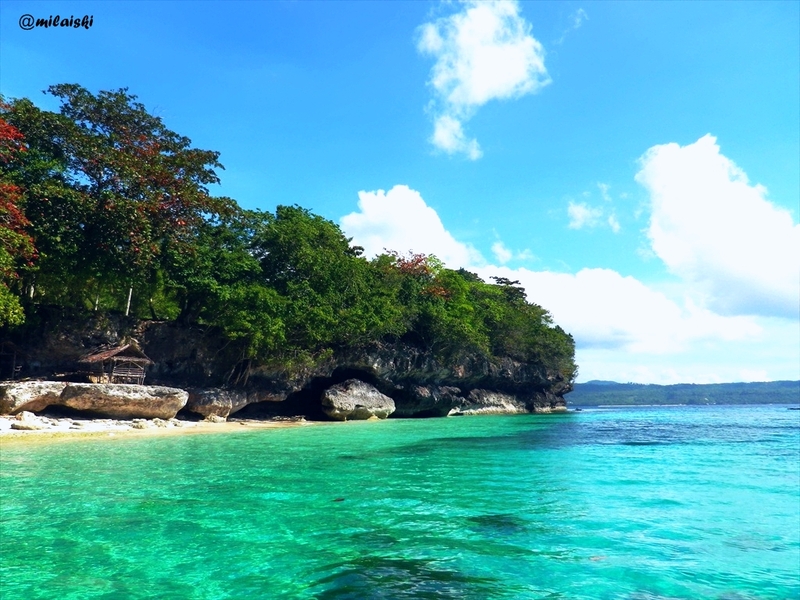 From Coral Garden, we continued to circle the coastline of Talicud Island until the boatmen stopped again at an area where we could snorkel to view sea stars. 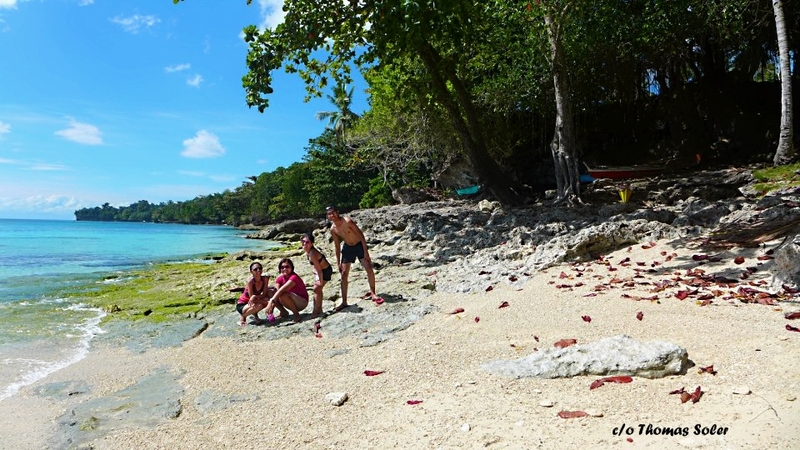 We did not stay that long in the snorkeling area since we were dying to see Isla Reta 2. I’ve heard rumors the place is beautiful and true enough, we fell in love with the place at first sight. It was high tide when we arrived so the beach area was a bit small but since the faint pinkish sand was still so beautiful, it did not matter. The trees by the rocks in the shore also provided great complement to the perfectly clear bluish-green water. Isla Reta 2 from a distance. Conney and the beautiful beach. 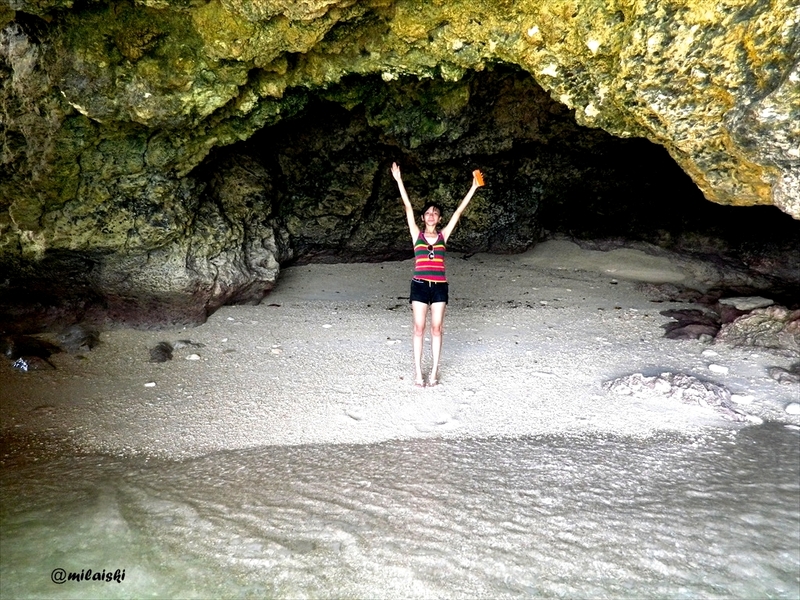 There was also a huge cave near the beach. We checked it our before basking in the waters and the sun. Cez by the cave entrance. 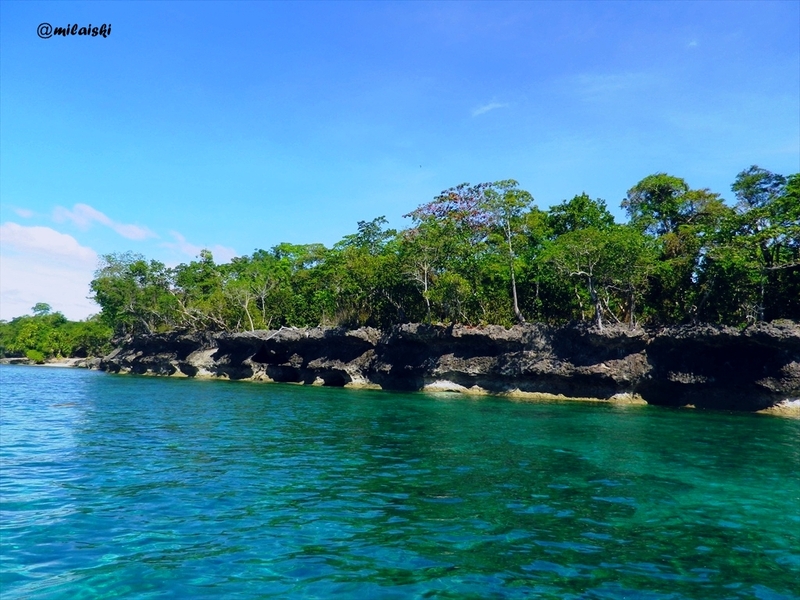 After satisfying our eyes with Isla Reta 2, we hurried back to Red Parrot Inn in Samal because we had to check out at lunch time and depart for Hagimit Falls. When we got back it was almost 11:30 already so we decided to forego lunch and just ordered mango shake. 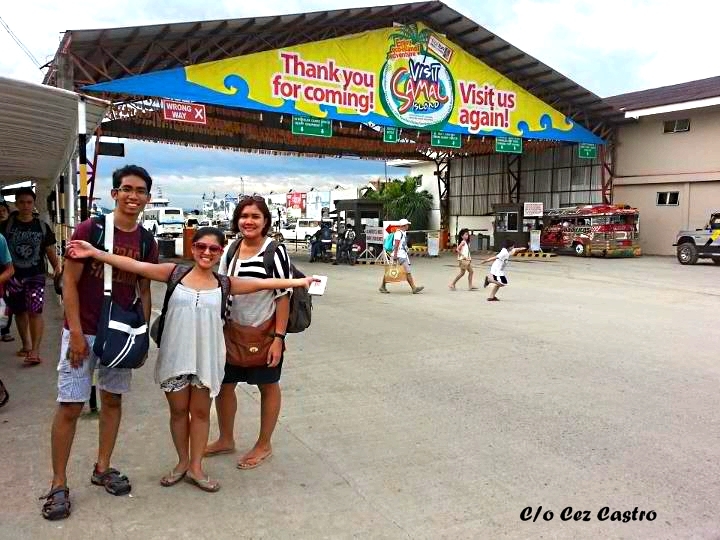 We checked out at exactly 1:30 PM and proceeded to the nearby Island Express terminal. Thankfully, a bus immediately arrived so at around 2 PM, we were on our way to Hagimit Falls already. Unlike in the mainland Davao, I am not familiar with the roads of Samal. I just asked the driver of the bus to drop us off near the entrance to the falls. About 45 minutes after we departed from Kaputian, the conductor of the bus woke me and and informed me we were in Hagimit already. We couldn’t figure out if we were in the right place because it was coconut trees that welcomed us. The lady at the stall where we paid an environmental fee assured us we were in the right place and guaranteed us that the falls is a just a short walk from the highway. So off we walked for 5 minutes, then 10 minutes, then 15 minutes! Talk about what “near” and “walking” with a 7-kilo backpack in provinces mean. After almost a decade, we finally reached the falls. We paid again an entrance fee prior to gaining access to the natural park. I thought we were done walking, but the falls was still a long way down from the entrance. Good thing there was a paved stair early so climbing down was easy. 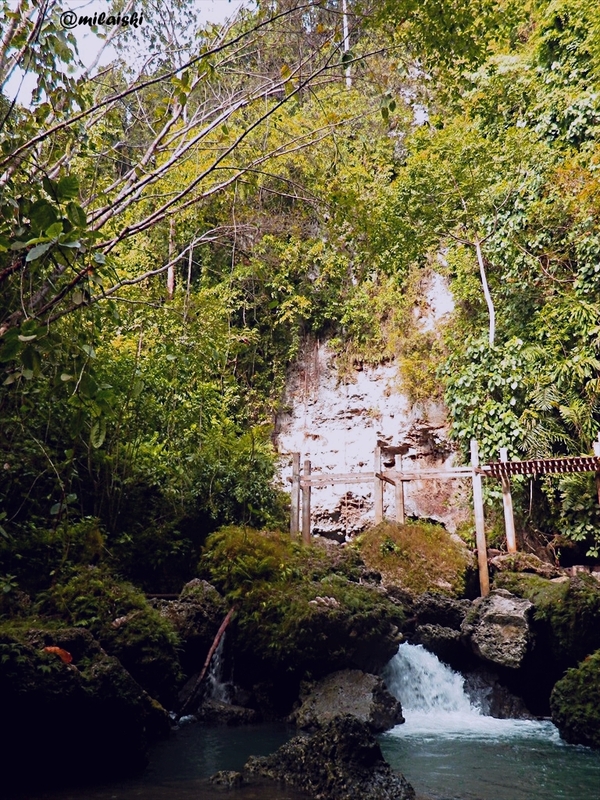 At the end the stairs, we finally got hold of Hagimit Falls. Turn out it’s not just one falls but a series of falls! There’s basically three levels. We were welcomed by the “second level” falls which I thought was the most gentle and visitor friendly since there were a quite a few people there when we arrived. From the “second” level we had to climb a steep stair again to see the largest falls. 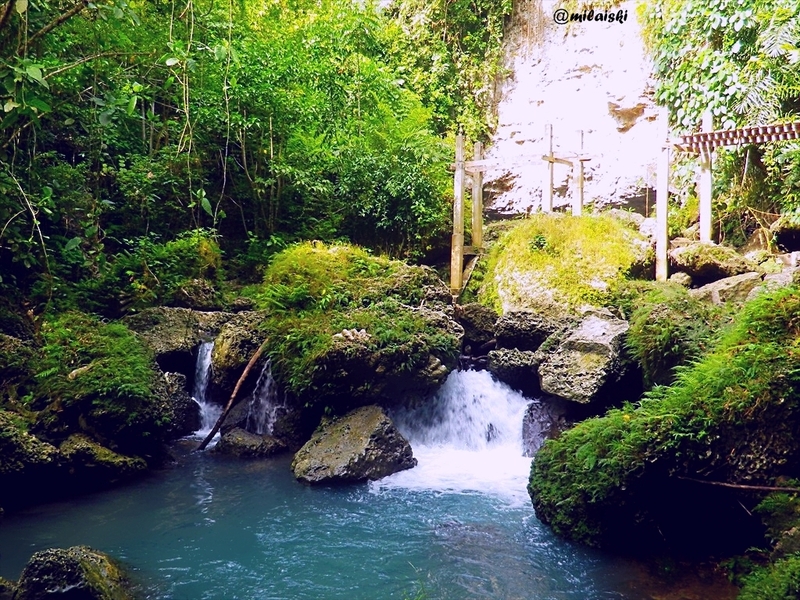 Out the different falls, I loved this the most. Aside from the sound of the thundering water, there were abandoned structures area near the falls that added to mysterious feel of the area. From the highest falls, we went back to down to see the rest of the park. 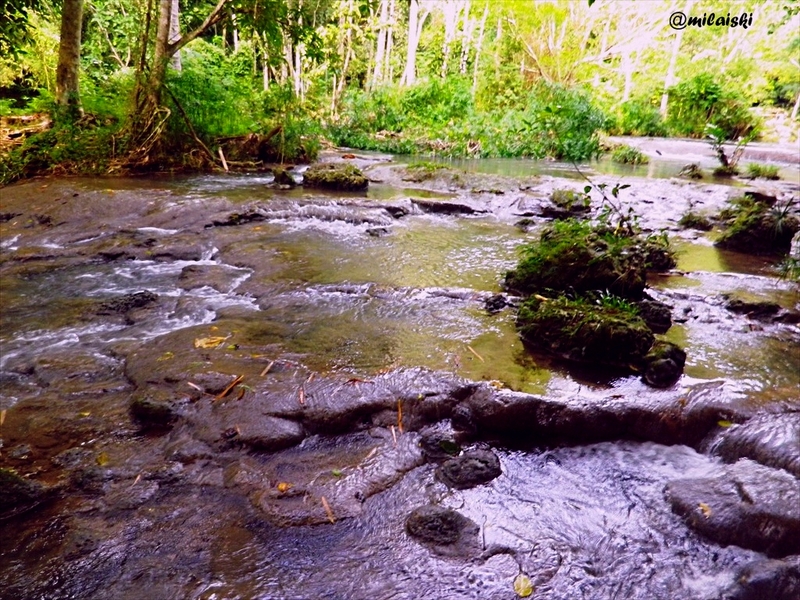 The waters were made up of alternating calm rapids and rushing water. The “first level” falls was probably the most photographed falls in the park. 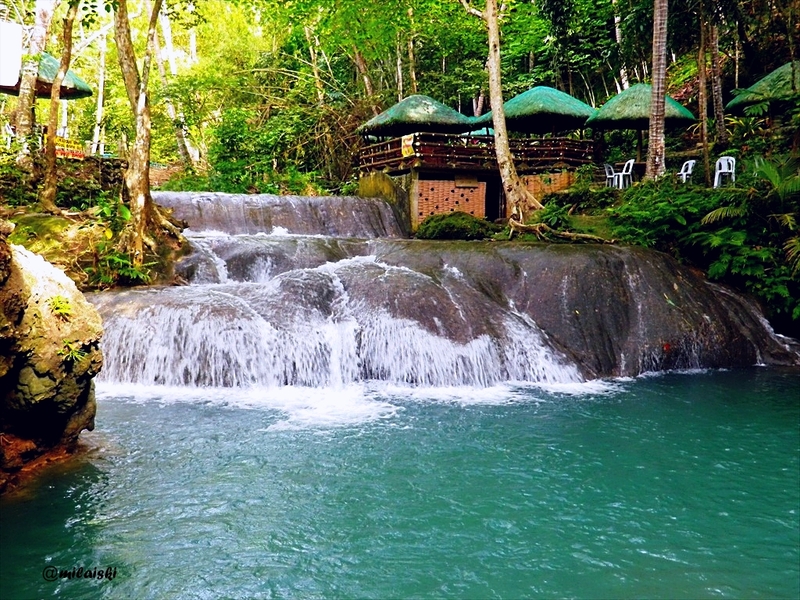 Based on the very smooth slope of the rocks, I believe these falls have been in Samal for a while. The area was also part of a private resort so it was more developed than the rest of the park. After scanning the whole Hagimit Natural Park, we dedicated to head back to the mainland since we had a plane to catch. It was already 4 pm and we still had several places to check out. 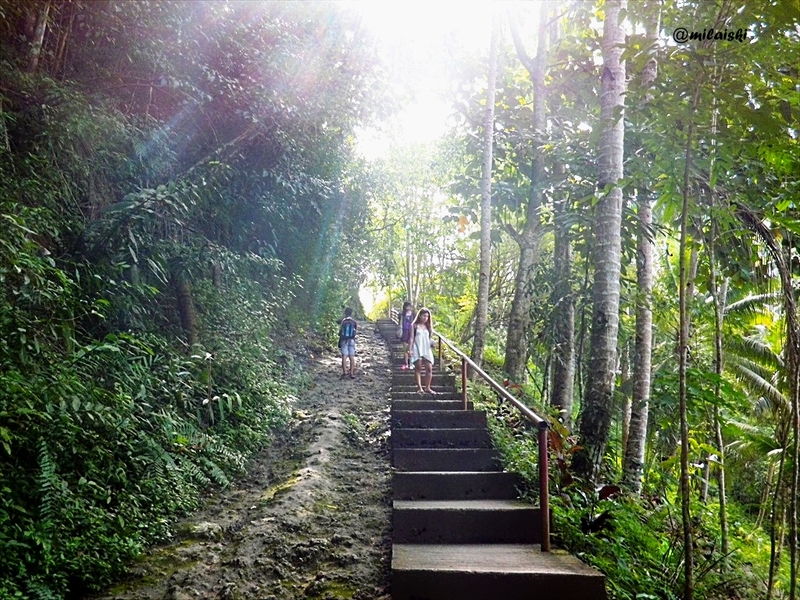 If the way down was tiring, the way back up was unbelievable. It was probably one the most tiring yet worthy climbs of life. I was hungry, sweaty form the mid afternoon sun and was carrying a 7-kilo bag. By the time we were back at the park entrance, we were all out of breath so we stopped by a nearby sari-sari store to rest. We also bought hard boiled eggs and a bottle of soda since we didn’t not eat anything for lunch. After retuning to our senses, we rented two habal habal to take us to the port. Too bad I was not able to take pictures of Cez and Thomas on the other motorcycle because it would be too dangerous to put out my cam during the ride. It did not take more than 20 minutes from Hagimit Falls to Babak Wharf, where the barge that would take us back to mainland Davao was waiting. We were so ecstatic when we found out that the ride from Babak to Sasa Wharf would only take 10 minutes and cost us Php 10 pesos. 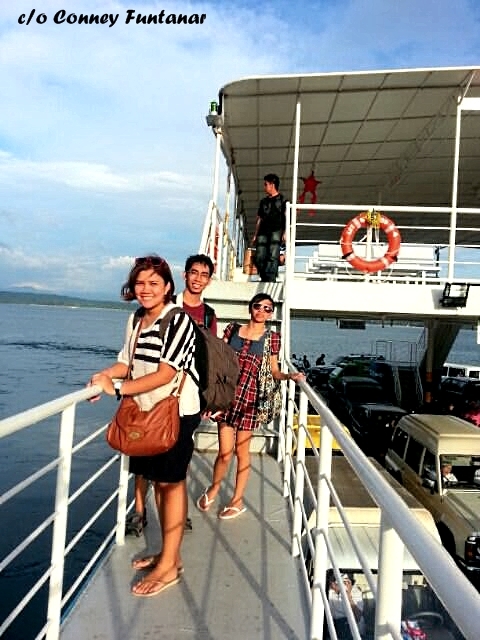 The barge can also accommodate vehicles–perfect for those who want to bring their cars to Samal! Cars on the 1st floor, passengers on the 2nd. From Sasa Wharf, we boarded a taxi on our way to Abreeza Mall. We marveled that the taxi had a TV inside and was showing MTV’s. 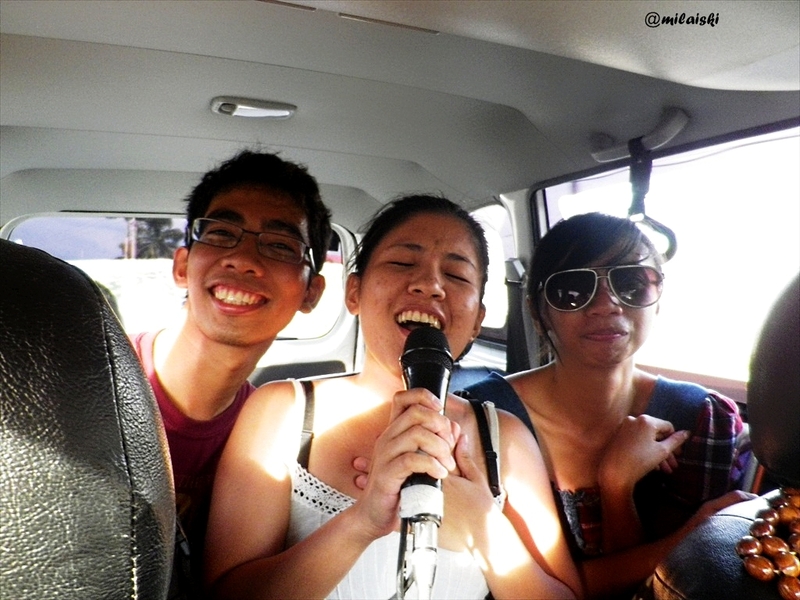 To our surprise, the driver handed us a microphone and told us he actually had a videoke system installed in the car. At first he was just randomly pressing numbers on the TV’s keypad then Conney wished there was a songbook so she can select what song to sing. And holla! The driver had a songbook! So all the way from the wharf to the city proper, we were singing our hearts out. What a good way to kill time in the middle of traffic and what an experience to remember! Upon arriving in Abreeza, we proceeded to the supermarket to buy some pasalubong. Then, we decided eat before heading to the airport. We were craving for seafood since we arrived but since we had no time go to Ah Fat Restaurant anymore, I just introduced my friends to Chikaan. 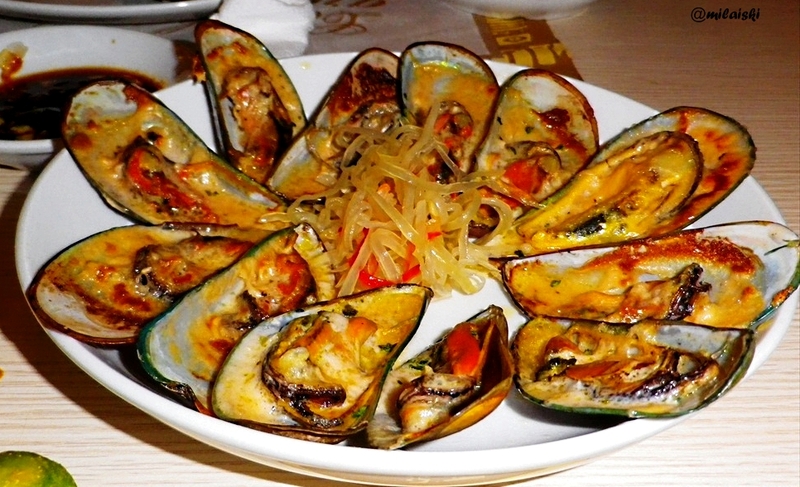 I encountered Chika-an first in Cebu and I remembered they served seafood. It’s also a big plus that their food is great but not that pricey. We satisfied our cravings for shrimp, scallops and clams. By the time, we were done we can barely get up from all the food we consumed. Sulit! After dinner, we immediately boarded a taxi because we barely had two hours before our flight. On our way, we dropped by a pomelo stand. Cezand I each bought a box to bring back to Manila. Finally, at 7 in the evening, we arrived at the airport. We had our bags checked, proceeded to the boarding area and waited for the plane. At exactly 8:30 PM, we boarded, sat in our designated seats, and wished that we could stay longer in Davao City. Not soon after leaving the airport, we could only close our eyes and sigh but the smileb in our faces was a testimony to our unforgettable experience. Personally, what stuck for me for this trip are not the beautiful beaches, delicious food, and thrilling adventure. It was the small moments which made me realize that I can conquer my fear and do better, and how in life simple things matter the most. My favorite moment from this trip was when we rode the habal habal on the way to Babak wharf. It was just us, the motorcycle, the road, the green scenery and the scorching sun. At that time, nothing else mattered but just the feeling of being in the moment. The pace at which the scenes passed before my eyes reminded me again how I’ve only seen so little of this big, big world. There’s a lot waiting to be discovered, experiences to be learned and people to get inspiration from. And thus I tell myself to walk, run, fly, and hopefully swim and see the world. Credits to Cez Castro, Conney Funtanar and Thomas Soler for some of the pictures I used for this post. 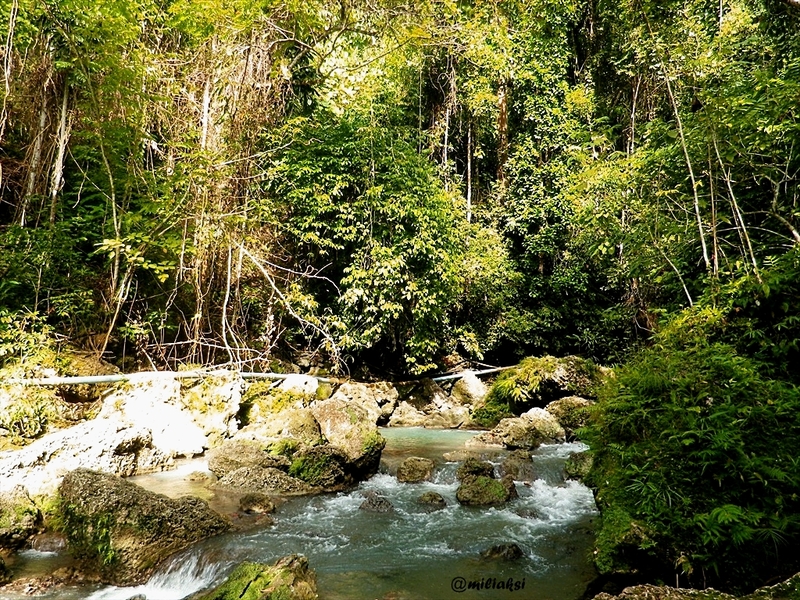 This entry was posted in Escapades, Food, Friends, Outdoor, Photography, Travel and tagged abreeza mall, chikaan, davao city, featured, food, hagimit falls, isla reta, outdoor, photography, red parrot inn, samal, talicud island, travel, white beach. Bookmark the permalink.